Becker’s picture book biography celebrates those of us who see the world differently from other people. The narrative hits the mark for a child audience, and Tremblay’s art, rendered digitally, adds the right touch of humor to the text. William Playfair was born in Scotland in 1759. He was a dreamer and enjoyed playing tricks on people. “He could be annoying, especially to his sisters and brothers.” The accompanying illustration shows a frog in the younger sister’s soup. As he grows, Playfair is trained in the scientific method and excels at math, yet he never stopped dreaming. His hope is to invent something that would make him rich and famous. 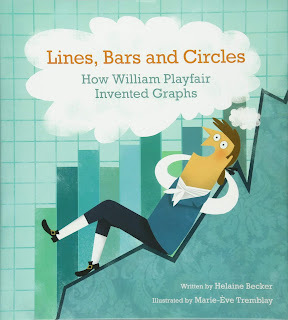 A prolific author, one day, as a way to organize his information, Playfair creates the first graph: a line graph.“When he wanted to include a second chart that had fewer details, he came up with another good idea: he grouped the information into chunks.” The first bar graph. With the onset of the French Revolution, Playfair moved to England and, still dreaming of how to represent information in pictures, he creates the first pie chart. Did Playfair ever become rich and famous with his discoveries? Nope! Not until more than a hundred years after he died (1823) would his charts be rediscovered and put to use. The book lacks any bibliography on resources used, but there is an extensive author’s note accompanies the does mention a few of Playfield’s books. An interesting introduction to inspire dreamers and makers.